7am Paddington. I'm shocked waiting for the train to find someone come straight up to me and ask if I was heading to Land's End. Not thinking I was sending overt signals that I'm really a MAMIL (what an awful acronym and one I only saw recently), he pointed to my give away label on the bag - a large laminated race number tied on with a blue cable tie. Looking around I realised that there were many of us - some with much larger and heavier bags. ..I know I'm missing one thing already the chamois cream that's supposed to be a life saver. Mental note to seek out asap on arrival! The journey to just past Swindon was like a busman's holiday - I heard about all the pros, cons, relative pricing and showstoppers for at least four of the tenderers presenting today to win the major R&D upgrade for a manufacturer's HQers in Wiltshire. I never quite understand how people think it's a good idea to talk about confidential issues on a train. Ho hum. 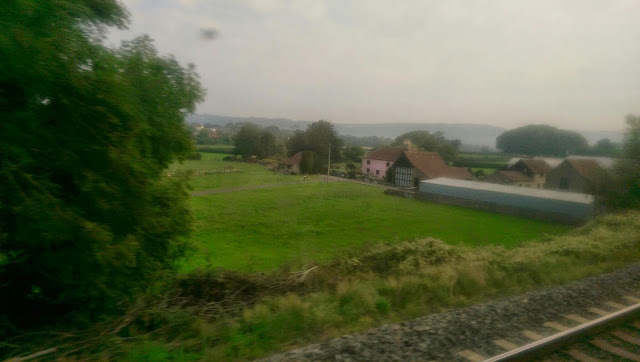 OK the photo isn't great from the train but it was meant to show that the sun was poking through the haze and remind me of where I'll be cycling to get back to Bath on Sunday evening.